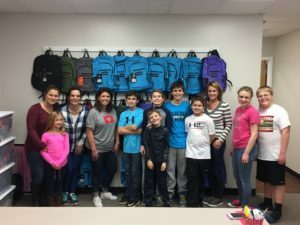 These bags are filled with new comfort and necessity items and are given to children (ages 0-18) as they are transitioned into a foster placement. Welcome Bags are delivered year round to local children. This is our first attempt to connect with and welcome a child into our community. We believe that the use of trash bags to transport a child's only belongings is further insult to the vulnerable child. We need your help with this. We need individuals, neighborhoods, churches, groups, schools, troops, and businesses to partner with us to host drives to create and fill these bags. Remember all items in the welcome bags should be in NEW condition. We partner with businesses, individuals, and community groups to host awareness events and enrichment activities at local venues. These opportunities, and Welcome Parties, allow youth in foster care and their families to participate in activities they may not otherwise be able to. Some of these activities include craft events at Christmas parties, and trips to sports complexes, YMCA, or other fun venues. Churches and organizations interested in hosting an awareness event to provide information about foster care and adoption are also in great need. We are always looking for new partners to host events, donate or discount supplies, and volunteers. Email us at contactus@warmwelcomes.org if you would like to join our efforts. We provide children in foster care opportunities to participate in outreach opportunities. Reaching Out events allow children to be empowered, while discovering some of their own gifts and talents by giving back to others. If you know of an organization that could use our help, please let us know. Childhood memories should be preserved for every child. We, alongside with A Child For Every Family, provide handmade scrapbook pages to make creating Lifebooks special for the child and simple for the foster family. We are always seeking local scrapbookers to get involved. Many children in foster care have few to no pictures of themselves to cherish. Volunteer photographers help capture individual, candid, and family photographs at events. We are also seeking photographers that would like to help with senior photos and adoption ceremonies, as they arise. Ornament making at Christmas parties is not only fun but provides children with a special keepsake to take with them. Pray for the children, birth families, foster families, court system, and the foster care community. Meet an urgent clothing or supply need, as they arise. These will be posted on Facebook. Host a donation drive in your neighborhood or organization: money, books, Welcome Bag supplies, toiletries, gift cards, etc. Provide a personalized or monogrammed items for a child to give them a sense of ownership. Be sure to check our Donate and Get Involved pages to find out more about how to help. Join us in WELCOMING A CHILD. There are numerous ways you can donate and help enrich the lives of youth in foster care.